What frame characteristics should we use to look for when building a fixie or singlespeed? First we need a reasonable price because if you can’t afford it you can’t build it. Frame quality too because of the amount of money, time and effort we’ll spend building the bike. We don’t want to waste work and money on unworthy frames and components that will turn out heavy, unwieldy, fragile or ugly. The quality of the components should match that of the frame. 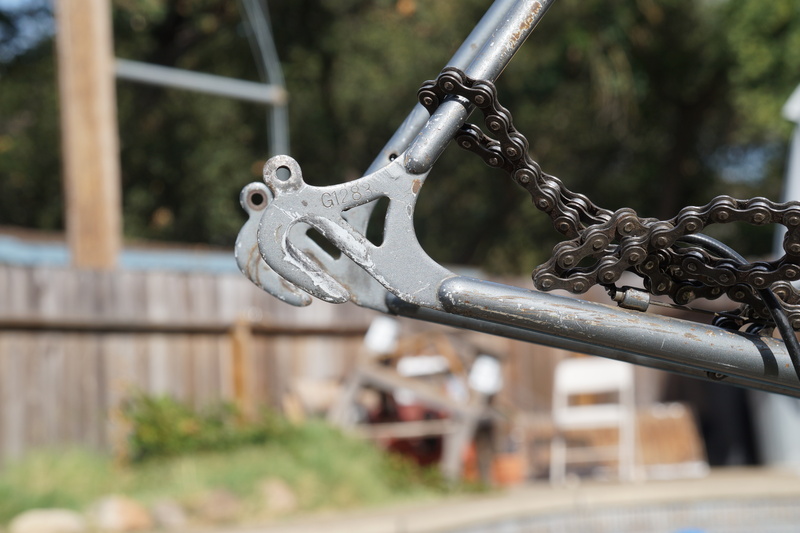 It’s OK to strip off and reuse inferior parts to get the job done, but good frames deserve good parts and we don’t use that many on 1-gear bikes anyway. So plan on upgrading to better parts when money, time and skill allow. One thing the frame must have is fairly long, ‘horizontal dropouts’. That is, the slot in the frame that the rear axle runs through should incline more or less horizontally; and the slot should be long enough to easily adjust the wheel forward and back to tighten and align. There are auxiliary jockey wheels that allow modern, ‘vertical dropout’ frames to be built as single-speeds or fixies, but such Rube Goldberg devices go against the minimalist nature of 1-gear bikes. Most suitable frames are steel, brazed together using lugs, and built in the 1970s and ’80s, though there are exceptions such as the Raleigh Technium and the ‘electo-welded’ Schwinns. 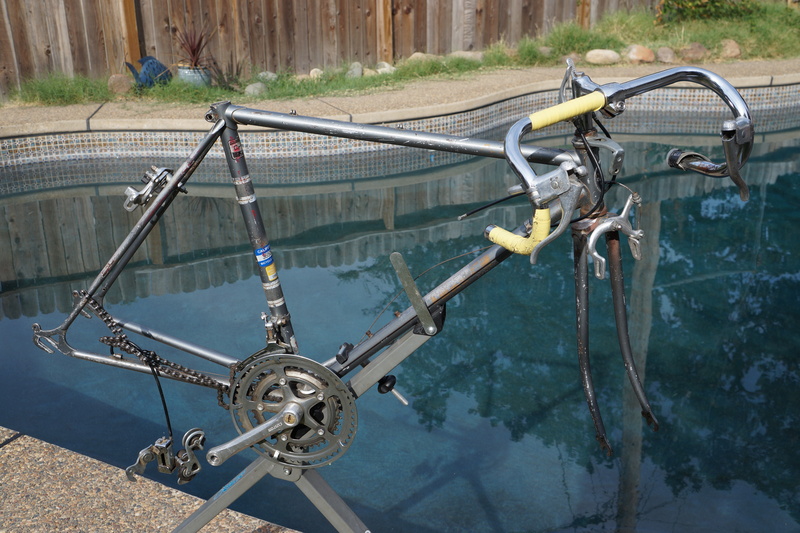 My bike building philosophy is to seek the best frame I can find. I look for straight, undented, unscratched frames complete with good original paint, head-badge, decals and stickers. Of course in the real world such ‘garage queens’ are rare and you might not build many bikes if you set your criteria too high. 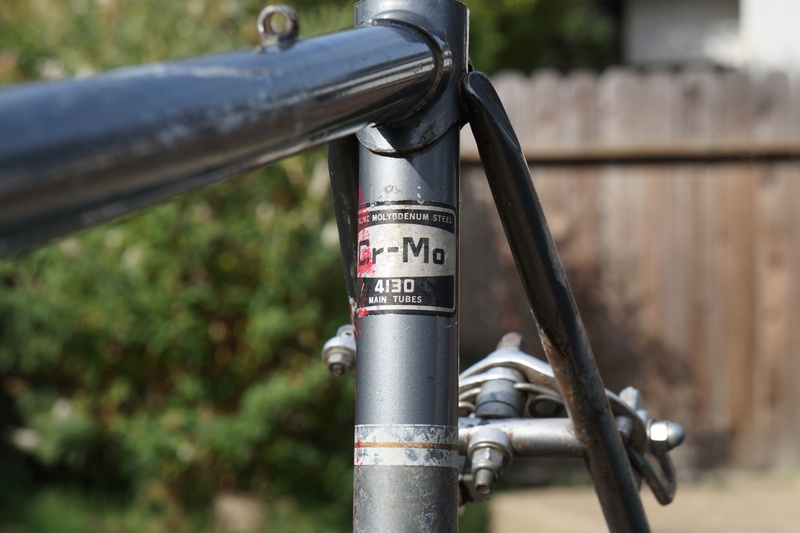 Chromoly (Chrome Molybdenum) Steel frames are best. Carbon or high-tensile (sometimes ‘Hi-Ten’) steel is strong but heavy compared to chromoly. When chromoly tubes are butted to reduce weight it makes for a light and long lasting bike. Chromoly is also flexible and springy making the ride less harsh. Look for tubes labeled Cro-Mo, CrMo, Chromoly, Vitus, Tange, Columbus, Reynolds, Easton or 4130. Heft the frame, the chromoly frame will be noticeably lighter than the ‘Hi-Ten’ frame. Flick the top tube with a fingernail and it should ring like a silver coin, while the heavier high tensile carbon frame will ‘thunk’. I build for aesthetics as much as anything and love the beauty of the vintage head-badges, paint, decals and stickers. I don’t repaint frames, it would destroy some of the beauty and authenticity. Home jingle-can spray paint can’t approach the hardness and durability of factory paint, and paint is toxic-while powder coating is expensive. So scratches don’t particularly bother me and I don’t sand or spot-paint. I don’t grind off unused component hangers either because some day the bike will be converted back to gears (but not by me). Lately, nearly all signs of age and use are considered desirable ‘patina’, so just lightly clean the bike, if you feel you must, and leave it as is. 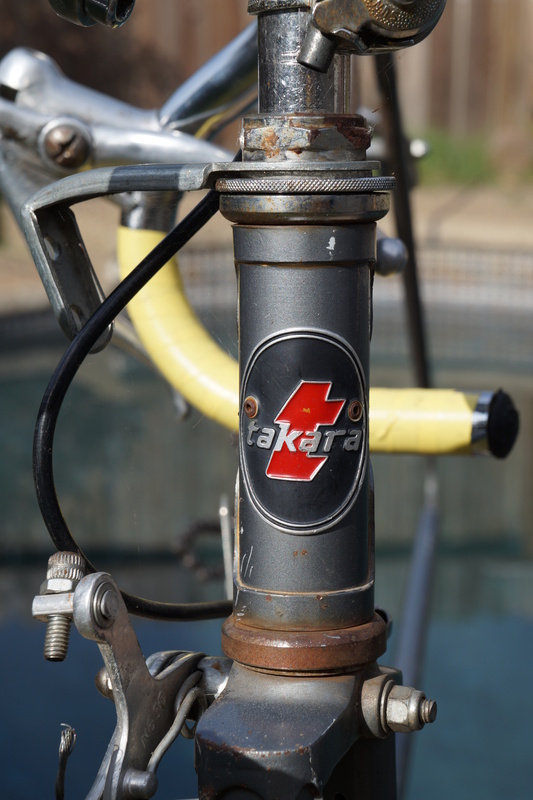 Next post we’ll think about what parts to keep and what parts to discard in turning this $25USD Takara frame into a singlespeed bike for me.